“Geezer Bandit” Continues to Frustrate FBI and Locals in Calif.
As serial bank robbers have done over the the many decades, the man dubbed the “Geezer Bandit” continues to frustrate the FBI and local authorities. On Friday, the “Geezer Bandit” held up his 13th bank in southern California, this time on Friday at a Bank of America branch in the town of Goleta in Santa Barbara County, the La Times reported. 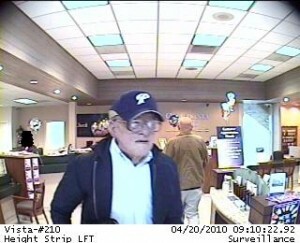 The bandit got his name because he appears to be about 70 or so. He started holding up banks in August of 2009. Most of the robberies have been in San Diego County, but he’s also done stick ups in Kern County and Riverside County. Recently, authorities have raised the possibility that the man has been using a Hollywood-quality mask to appear older than he actually is.